MARCOM's Fall Protection in Construction Environments Construction Safety Kit provides the information employees need to work safely when they are off the ground, and helps to satisfy the major training requirements in the OSHA Standard on Fall Protection. Falls are the second leading cause of death each year in the United States (after traffic accidents)! Over 10,000 people are killed every year as a result of falls...and 200,000 to 300,000 people are disabled. Eight-five percent of all falls that occur on the job result in lost work time. Materials in the kit include a DVD program, five motivational posters, and 30 employee booklets. The posters in the kit remind employees to work carefully and safely. 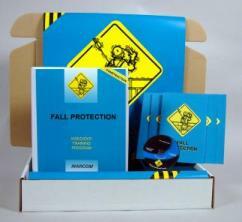 The DVD program and employee booklets include information on the seriousness of fall hazards, types of environments where falls may occur, the fall protection plan, concentrating and keeping a clear head, the importance of housekeeping in preventing falls, measures that can be taken to protect against falls, protective equipment, and more. The DVD program in the kit comes with a comprehensive leader's guide, reproducible scheduling & attendance form, employee quiz, training certificate and training log.